Classified Notifier is a Search Engine and Notification System for leading online classified advertising services. With Classified Notifier you can simultaneously search in multiple cities, multiple states, nationally and internationally. Classified Notifier will search classified web sites and notifiy you when specific items are posted. Be the first to respond to new online postings. 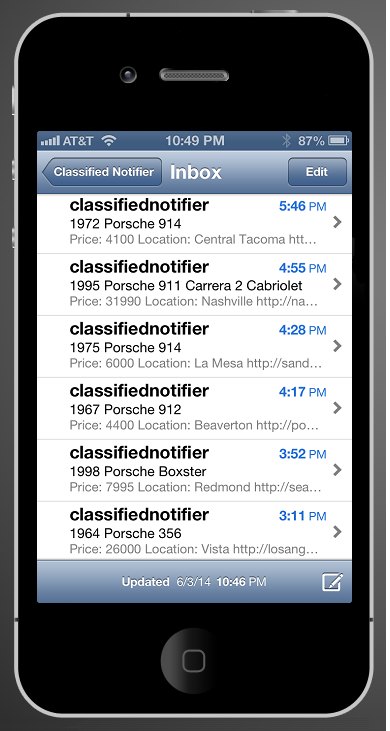 If you are looking for something that is not yet available, Classified Notifier will contact you when an item is posted. Don't waste your valuable time constantly searching and hoping someone else doesn't find it first. With Classified Notifier you will receive an email notificaton or text with the information you need to respond immediately. Receive notifications on your mobile device and respond before anyone else. Classified Notifier is now available in two versions. The original Classified Notfier for Craigslist and recently released, a new version for Kijiji, the leading online classified service in Canada. We are currently developing a version for Facebook Marketplace. Try Classified Notifier by selecting the button below, or learn more by reading the user's guide or viewing the screen shots. Please feel free to contact us if you have any questions or would like to request a new feature.